This is the first official “Money Where Your Mouth Is Challenge” from Indie Game Riot. The idea is, they will select a game that has fallen off my radar for me to review. I purchase the game, and they match the price of the game as a donation to the Epilepsy Foundation (in one big donation at the end of the year). In theory, they’re looking for good games for me. But I’m not so sure. I think they might have been trying to cause my blood pressure explode and give me a massive coronary with today’s game. Schein is a platformer with a neat idea: certain platforms and traps only appear if the right color light is being is shining on them. This could, and in fact did, lend itself to some nice puzzles. The problem is, Schein wanted to be a puzzler, but it also wanted to be a punisher. Not just a punisher, but one that subscribes to the “no warning instakills” theory of challenge design. Forcing players to die as the only way of discovering a trap doesn’t make your game challenging. It’s not really a challenge if you have no hope of succeeding. All it really does is make you repeat the same section, now with full awareness that there is something that can kill you in a specific location. A real challenge is having something there that can still take you by surprise, but you also have a reasonable chance of reflexively avoiding. Some people call this trial-and-error gaming. Trial-and-error gaming is perfectly fine, as long as the game is based just around that mechanic, such as The Impossible Game. Otherwise, trial-and-error only works as long as there’s a chance, even a remote one, of clearing an obstacle on your first attempt without needing luck. When you can’t, that’s just making busy work for players, and it’s not fun. In Schein, you’ll sometimes be forced to turn your light on to see a platform. Sometimes though, the spot you’re standing on has a vine that is only deadly when you can see it, when the light is on. 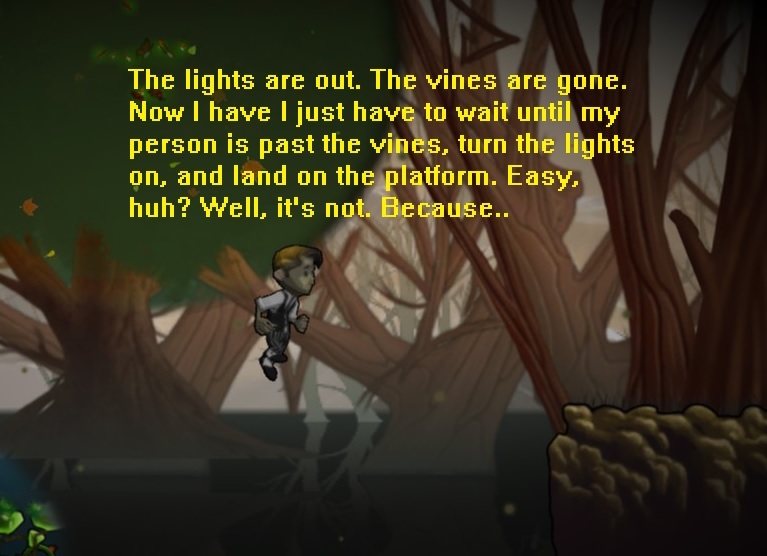 You had no way of knowing that vine is there and you die. Schein does this a lot. It’s such a common mistake among indie developers of punishers. In the above example, the vine isn’t challenging. When you learn about it and die, you didn’t die due to difficulty. You died because you had no way of knowing it was there. Let me put it this way: let’s say you have a game where you’re in a town and you talk to one person in the town. That person tells you they’ll only give you what you need if you go to a person on the other side of the town. You have to walk across the town to talk to that person, grab what they had, and then walk back. Was that a challenge? No. It’s just walking across town. 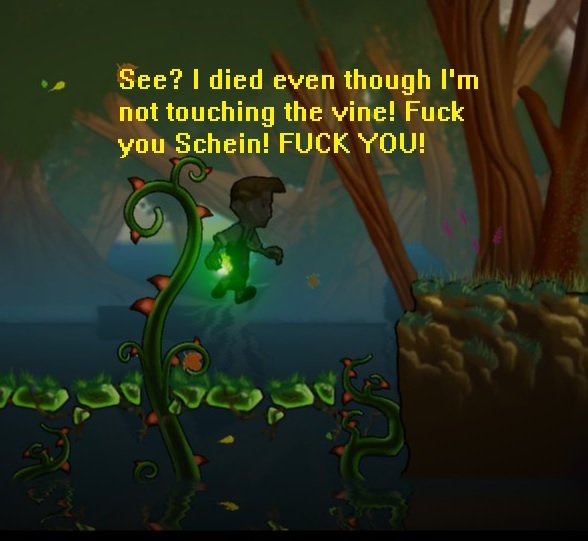 Well the unseen vines in Schein are pretty much that. 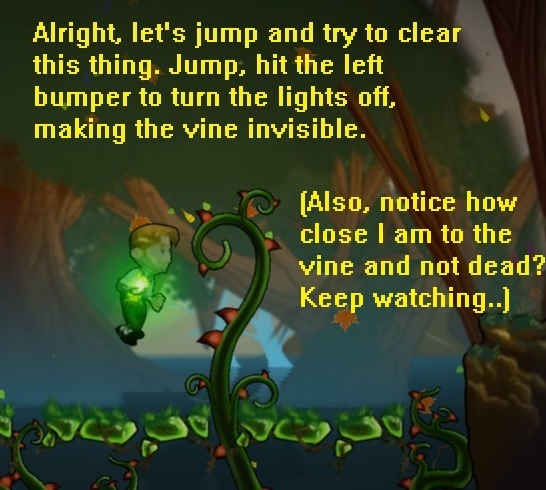 Run into a vine to discover its awareness, respawn at the check point, walk back to the spot where the vine is and hop over it before turning the light on. There was nothing challenging about it. All the vine did was make busy work for you. Go from point A to point B, watch unavoidable event, return to point A and go back to point B.
I wish Schein had just been a puzzler. It does puzzles fairly well. But the platforming mechanics are not suited for the type of game Schein might want to be. It’s a confused game, unsure whether it wants to be a punisher or a puzzler. 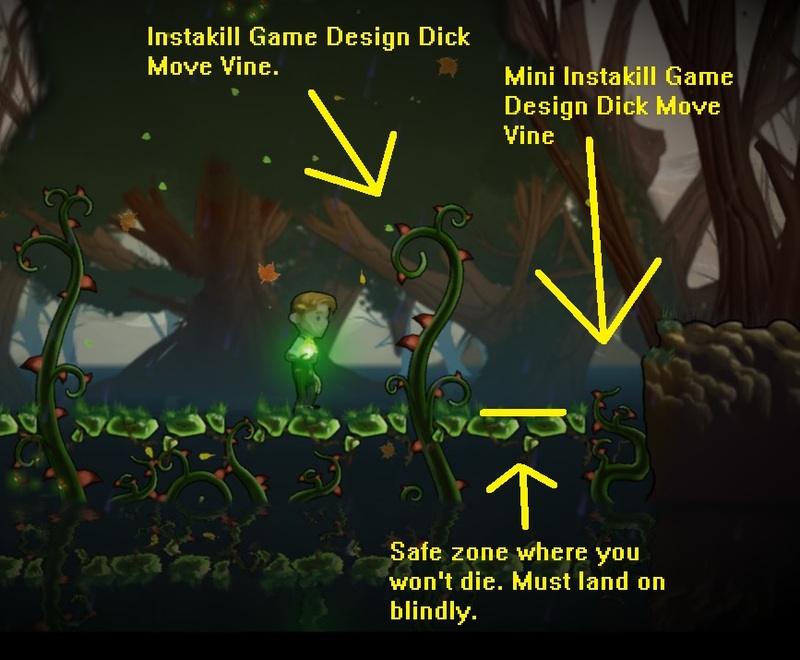 There’s too many instakill spikes and vines, and because the game uses rectangular collision detection instead of mapping it to the character, the margin of error is razor-thin. Combine this with the bleak, joyless visuals and I just couldn’t get into the game. It was practically exhausting. I quit Schein after putting four hours into it and not really enjoying any of it. My early optimism that this was going to be a less bleak take on the type of platforming Limbo made popular was gone within just a few minutes. If this hasn’t been IGR’s challenge against me, I wouldn’t have played it as much as I did. I wanted to find something to complement other than the voice acting and character design. But even the puzzles that I slogged through the platforming sections to get to became tedious busy work. The concept behind Schein is really solid. But the forced-repetition of the puzzles, bad collision detection, and some just plain bad design choices sink this one. On the opening stage, the area of green “revealing” light is fairly small. Why? It doesn’t help the game. The light stuff becomes significantly better after you beat the first boss and the light becomes bigger. Also, the placement of the checkpoints is mind-boggling too. Sometimes a fairly simple puzzle is sandwiched between two checkpoints, while at other times, the checkpoints are spread out so far that you’ll be practically begging for one to show up, so that you don’t have to run through a dull platforming section more than once. I spent more time wondering why such design choices were made when they only serve to contribute to the game being less fun. There is a satisfying puzzler somewhere in this mess, but it’s buried under so many bad choices that I personally can’t recommend Schein. I like puzzlers. I don’t like Schein. It’s boring. I wish I could see why so many people are raving about it, but I guess I’m in the dark. $9.99 said Geoffrey Rush was unavaiable for comment in the making of this review.